Carborade® is a new proposal in powder for preparing energy drink. It is a complete formula based on maltodextrin, glucose and fructose, enhanced with electrolytes. 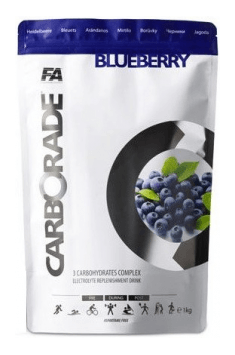 The primary purpose of Carborade® drink is to supply carbohydrates in a rapidly absorbable form in order to provide fuel for hard-working muscles during vigorous exercises. A secondary use of energy drinks is to help refuel muscles after exercise, when it might not be possible to consume adequate carbohydrate in the form of a meal or snacks. All these goals you can achieve using Carborade®. Product contains a combination of quick-releasing simple sugars and slower-releasing longer chain sugars in order to provide a quick acting, yet sustained increase in blood sugar, which in turn helps to keep fuels for muscles. Glucose and fructose as simple sugars are easily and rapidly absorbed into the bloodstream and are ideal for rapid transport into the working muscles. Additionally fructose, combined with glucose enhance the maximal uptake of carbohydrates into the working muscles that gives additional performance benefit. Maltodextrin is on one hand readily absorbed sugar, but on the other hand provides a gentler and more sustained rise in blood sugar. Moreover Carborade® supplies electrolyte minerals such as sodium, potassium, calcium, magnesium and chloride. Electrolyte replenishment is very important, especially during prolonged heavy training session when significant mineral losses can occur. Carborade® is the best proposition for all active people. Świetny produkt. Z góry polecam !!! Doskonałe, świetnie się rozpuszcza idealne jako uzupełnienie diety oraz coś co da ci energię podczas treningu. Smak grejpfrutowy bardzo smaczny, jagodowy ujdzie ale odrobinę mdły jak dla mnie. Cena całkiem przystępna także polecam. 1 portion (1 portion = 25g, or 1 scoop) per day. Dissolve 1 scoop in 300ml of water. Consume before, during or after a workout. The product prepared primarily for athletes. It helps to replenish carbohydrates during intense workouts. There are no contraindications to the use of non-a workout days. 1 portion (25g = 1 scoop) should be dissolved in 300ml water. The best fuel for the body. The complex carbohydrates that will survive the toughest workout. I recommend especially endurance athletes and endurance athletes. A solid dose of carbohydrates, which is why I recommend to use around workout time. I know from experience that if you plan standard hour workout perfectly suited to before or after a workout. Just dissolve 1 scoop of powder in 300 ml of water and drink. For long, several hours of a competition or a workout is best to consume during exercise. This will survive the crisis, and clearly will add strength and energy. In principle there is no restriction on dosage, if necessary, can be used to increase the dose and 2-3 portions a day. If someone sees the need to replenish carbohydrates in such a way that there is no impediment to eat well in days without a workout. Maltodextrin, sodium chloride, potassium citrate, magnesium citrate, calcium chloride, acidity regulator (lemon aroma), flavors, sweetener (sucralose), E171.